tattoos on your brain. : more day in Bern. It has been a while, but here is the rest of Roel and my stay in Bern. Here you can read what we did on our first day and some other things. I'll pick up where I left off about a month ago. Our second day in Bern was pretty similar to the first one. Firstly, we had to pack our camping gear; in the afternoon we would leave for Einigen. We wanted to go to the Einstein Museum, but, just like anything in Bern, it was ridiculously expensive, so again, we did some goalless strawling. 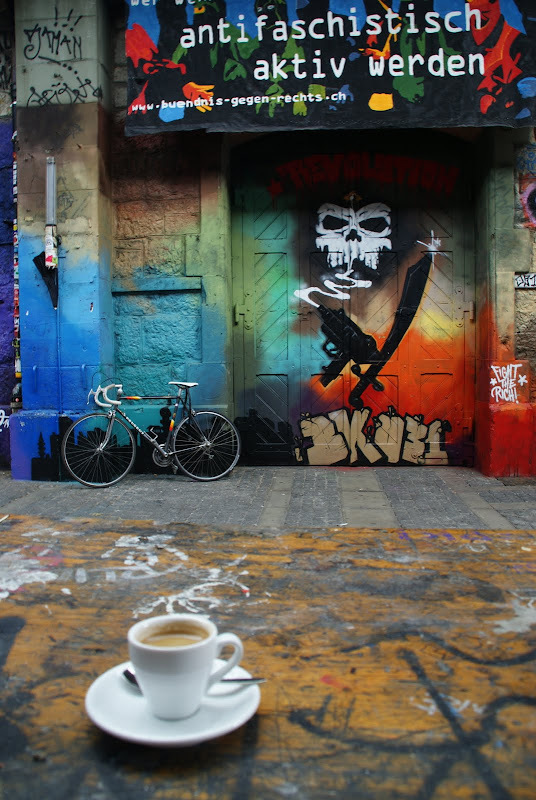 We went to some squatting places where we had an espresso an a really good coke! They were pretty inspirational spaces. We strawled some more, but, no surprise here, we ended up at the Bundesplatz and set there for several hours again; just watching the water go and the children play. Finally, we strolled along the Aar again and made way for the camping we could drive to Einigen. I did some scandalous driving through Bern. Yeah, I can be a rude driver when I'm in the city. Anyhow, I will not bore you with all the pictures I took at the family festivities; there are many. I might just make a tiny selection for the next post, but I might as well just skip to the Cologne pictures. I'll surprise you! Then I'll just leave you with a pretty panorama of Bern.